It was certainly an eventful day in the minor league system for the Blue Jays with several promotions in the works although only one has been formally announced. I wrote about two of these moves, involving Matt Boyd and L.B. Dantzler, yesterday and Charlie Caskey had several other moves in his blog (thanks to some great inside sources that he has at extended spring training). 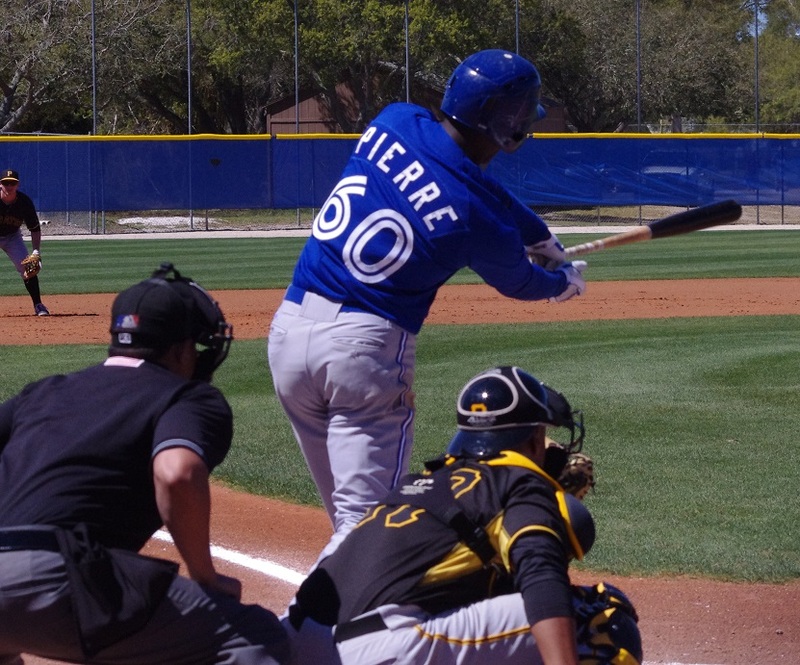 As usual, check out the Jays Journal Minor League Report for more info about yesterday’s games. In what seems to be becoming an annual April ritual, the Bisons’ bats exploded all over the Louisville Bats’ pitchers and the club won a laugher by 12 runs. Unlike last year’s offensive demolition of an opponent, there was only one home run for the Bisons this year, Ryan Schimpf‘s first Triple-A dinger. The small but powerful player (playing second base yesterday) went 1/4 with three runs scored on two walks in addition to the home run. Kevin Pillar had a 4/4 day with two walks, two stolen bases, three runs and four RBI. Other three-hit days went to Matt Tuiasosopo (3/5, 1BB, 4 RBI), Darin Mastroianni (3/6, 3 R, 2 SB) and Erik Kratz (3/4, 2 2B, 3 R, 1 BB). Kyle Drabek had a fairly rocky outing, allowing only two runs on six hits and five walks but he was able to strike out six batters in five innings. Rob Rasmussen gave up the other two runs and John Stilson is still searching for clean innings after giving up a run on three hits and a walk in 1 2/3 innings. 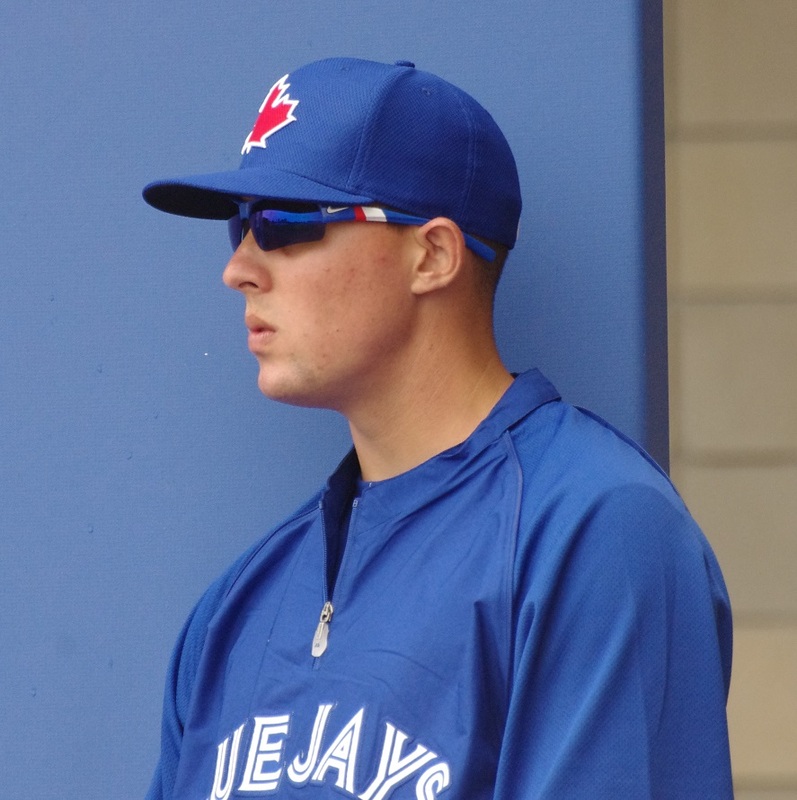 Roster Note: 2B Ryan Goins was optioned to Buffalo from Toronto and Chris Getz will be called up today. More as it develops. Despite an outstanding start from Aaron Sanchez the Fisher Cats lost 2-1 to Trenton. Sanchez had his longest outing of the year, going 6 1/3 innings without giving up a run on five hits and two walks with six strikeouts. Sanchez actually didn’t allow a fly out (with 10 ground outs) in the outing. The two runs came off of Richard Bleier (only one was earned) who went the rest of the way (2 2/3 IP, 4 H, 2 R, 1 ER, 1 BB, 3 K). The offense was pretty anemic with just four hits including two from Mike McDade. Brad Glenn drove in the only run and hit a double. Jesse Hernandez pitched one of his best outings of the year so far, throwing six innings and giving up only one run on three hits and a walk with four strikeouts. Relievers allowed two runs as the offense went to work with nine hits and five runs: just enough to come out with the club’s 19th victory of the season. Gustavo Pierre was the only player to amass more than a hit: he drove in two on three singles. Dalton Pompey hit an RBI triple and took a walk (batting average is down to .366) while Dwight Smith hit a double (1/5), Derrick Chung and Christian Lopes also had RBI doubles. It was a strange game for the Lugnuts as Adonys Cardona only pitched to three batters before leaving with an injury (he got tagged for the loss, giving up a hit and a walk and both runners came around to score). Roberto Espinosa relieved him and got shelled allowing Cardona’s two inherited runners and another four runs of his own in that first innings (and another in the third). 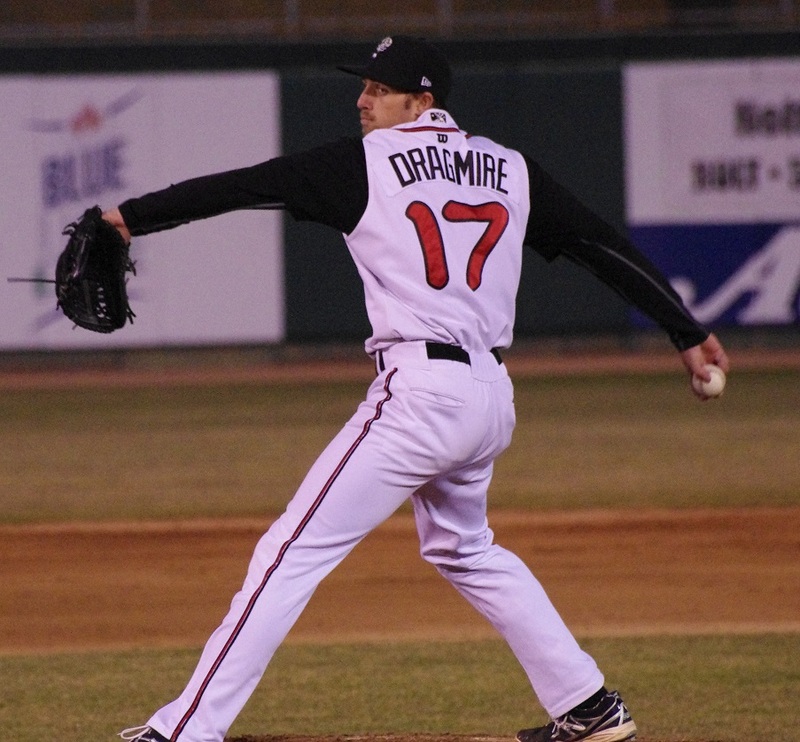 Brady Dragmire gave a herculean effort, finishing the game, throwing 5 1/3 innings and allowing just one run on five hits with two strikeouts. Dawel Lugo had a mini breakout with two hits and a walk while Mitch Nay, L.B. Dantzler, Derrick Loveless and Matthew Dean each hit a double. Interestingly, in the second inning, thanks to the wildness of Dragons’ starter Ismael Guillon, the Lugnuts scored three runs without the benefit of a hit. Roster Note: 1B L.B. Dantzler was activated from extended spring training and LHP Jairo Labourt was sent back to Florida to extended. Chase DeJong is expected to start today in Dayton, getting his own day and ending the piggy-backing for that combination (Cardona’s injury also doesn’t help). I was really thinking of heading down to tonight’s game in Buffalo but the weather just doesn’t look good out there. If there is a game, you’ll see Marcus Stroman take on Jeff Francis and the Louisville Bats. Francis has been excellent so far for the Bats and is trying to get a callup to the Cincinnati Reds. He’s made five starts and has a 2.45 ERA and has allowed 34 hits and just four walks in 29 1/3 innings with 29 strikeouts. In his four starts, Stroman has struck out 26 batters in 20 2/3 innings with just six walks and has a 2.18 ERA. Interestingly, five of those six walks came in one game (in which he struck out eight). Also interestingly, he’s given up 22 hits but 10 of those came in his last outing. If he puts it all together like he did on April 16 (5 1/3 IP, 5 H, 0 BB, 9 K), he’s going to be scary good. The game is at 6:05 PM on MiLB TV. The Fisher Cats send Deck McGuire to the hill against Trenton’s Joel De La Cruz. De La Cruz, 24, is off to a solid start with a 3.86 ERA in 23 1/3 innings. He’s effectively controlled runners on base (24 H, 6 BB) and he appears to be a ground-ball pitcher, getting 2.47 Ground Outs per Air Out and only 12 strikeouts so far this year. McGuire has been excellent for New Hampshire and, if space opens up in Buffalo, won’t be there long if he keeps it up. In 28 1/3 innings, McGuire has a 2.54 ERA with five walks and 23 strikeouts including eight in his last outing, his best of the year (7 1/3 IP, 3 H, 0 R, 2 BB, 8 K). McGuire has been much more consistent in 2014, hitting his spots and making batters hit his pitches. I’m very pleased by what I’ve seen so far from the big Virginian. Catch Tom Gauthier and Bob Lipman’s call at 6:35 pm. What can you say about the insanely good Dunedin Blue Jays and their starter today Daniel Norris? Wow, I think, covers it. Combined with an extremely efficient offense, the pitching has been spectacular and Norris will co-inherit the “ace” role along with Taylor Cole. Norris is 2-0 in his four starts and has only allowed three runs (two earned) in his 19 innings to give him an 0.95 ERA on the season. He’s also allowed less than a base runner per inning (just 13 hits and five walks) and has struck out 21. The 21-year-old lefty has (by all reports) looked like a new man this season with more poise and command than ever. The Tampa Yankees haven’t announced their starter. Catch the action at 7:00 pm. Playing a tough Dayton Dragons team, the Lugnuts can show that they’ve got some moxie of their own in this series. They send Chase De Jong up against lefty Amir Garrett and the Dragons. Garrett has had a rough start to the year, walking nine batters in 16 innings, allowing 24 hits and 14 runs (10 earned). His 0-2 record and 5.63 ERA speak to his struggles. De Jong’s 4.61 ERA hasn’t reflected what he’s been able to do in his last two appearances, keeping his opposition off the board over a combined seven innings. He’s been unchained from his piggybacking partner and should be free to go about five innings now. Stay tuned to the Blue Jays from Away Podcast (coming tomorrow) to hear my interview with Chase De Jong. He talks about his (and the team’s) early season struggles as well as pitching, Lansing, and having a cousin (Jordan De Jong) who blazed a trail for him in the organization.